Rundeck Enterprise delivers what you need to run Rundeck as an enterprise-class service. Rundeck Enterprise is a subscription bundle that includes exclusive features and plugins, as well as professional support and on-boarding services. Create standard procedures from existing tools, scripts, and APIs. Build self-service processes within and outside of Operations. Reduce ticket queues. Remove roadblocks. Enable teams to move faster but stay under control. High-availability and scalability are essential, and Rundeck Enterprise's cluster features do all of the heavy-lifting for you. Rundeck Enterprise features enhanced workflow and visualization features to handle the advanced needs of enterprise environments. Rundeck Enterprise provides tools that make it easy to manage and validate Rundeck access control policies. Rundeck Enterprise provides expanded visibility into your past, current, and scheduled Rundeck activity. Rundeck Enterprise’s Windows power tools plugins help you get the most out of Rundeck in your Windows or mixed environments. Packages for typical Enterprise customers start around $20K - $60k per year, depending on size and support options. From advice about your Rundeck usage to help with troubleshooting, our experts are here to help. Unlimited support means no restrictions on support tickets or inquiries. Ask and we’ll answer. Short of writing code or configuring your servers, our support team will have you covered. Rundeck engineers will help you through the first steps of your implementation. Get up and running quickly. Learn about core concepts that will make you more successful with Rundeck through training webinars and self-help materials focused on different topics. Are you maximizing your Rundeck usage? Get guidance from our experts on integration and optimization. Share your Rundeck successes and get expert advice on issues. The Rundeck team is here to help you conquer challenges as they arise. In addition to high-availability and scalability, Rundeck Enterprise's cluster features give you control of where jobs execute within your Rundeck infrastructure. 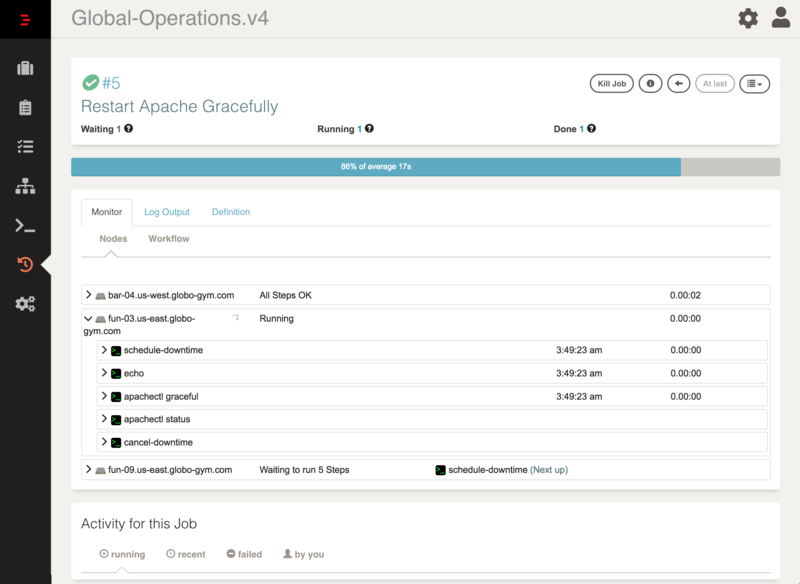 You can direct user traffic (GUI and API) to one set of Rundeck Enterprise instances while setting aside a different set of Rundeck Enterprise instances to handle job executions for specific Rundeck Projects. Seamlessly adjust capacity as needed. If any of the Rundeck Enterprise instances in your cluster are unreachable, the built-in heartbeat service prevents downtime and manages schedule takeover. (based on option variables or other steps). Seamlessly move between parallel and sequential execution in the same workflow using a fork-join branching model. Configure built-in error handlers to determine what to do if a step fails. Graphical visualization of the workflow makes it easy to write and follow the execution of workflow logic. 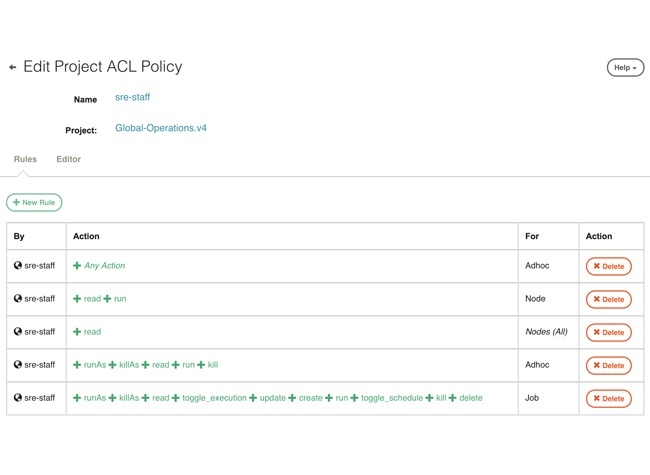 As your Rundeck usage grows, you will have more access control rules to manage and more user roles to test against those policies. Rundeck Enterprise provides advanced tools to simplify those tasks. Use Rundeck Enterprise's advanced rules editor to build and understand access control rules quickly. Verify the effect of changed rules using Rundeck Enterprise's access rules evaluator. Delegate project-level access control to project admins while maintaining separate system-wide access policies.